The internet is global. But restaurants are not. In fact, restaurants are the quintessential local business. Even large restaurant chains exhibit one simple fact which sets them apart from many industries in the 21st century: your customers come from the same place as your restaurant. In this article, I’ll show you a few tools, techniques and services you can use to improve your restaurant’s visibility for local searches and help drive traffic to your establishment. When people are looking for a restaurant, they don’t search for “Thai restaurants”. They search for “Thai restaurants in Chicago”. That may seem obvious. But it’s a critical distinction to make when you’re planning your online marketing strategy. Over half of all searches made “on the go”, such as from mobile devices, are local searches. And more than half of all local searches lead people to purchases in bricks and mortar businesses. If you’re going to pick up this traffic, Google needs to know where you are. They need to know what you do and when you’re open. 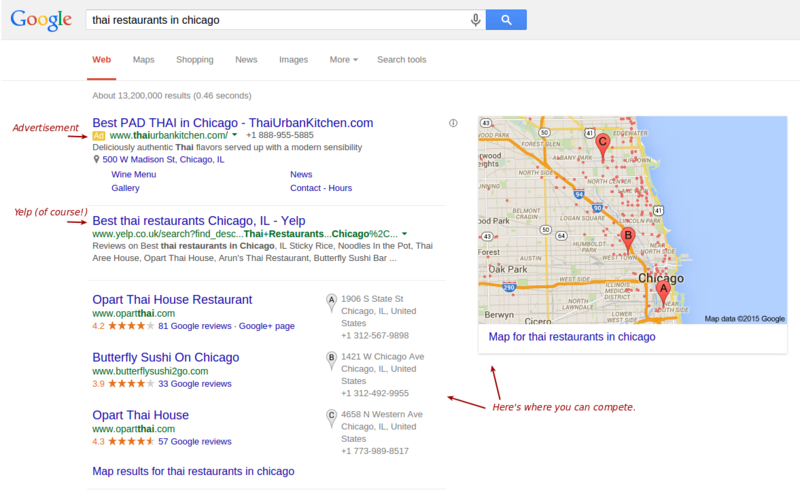 They use this information to inform whether or not you appear when someone searches for “Thai restaurants in Chicago”. Here’s what that might look like. 1. You won’t win the top slots for a search in any medium- or large-sized market. These will go to paid advertisements and the dominant indexing service in your area. In the U.S., this is Yelp. But other big players like Trip Advisor can also win these spots. Either way it won’t be you, unless you’re willing to pay for the ad spot. 2. When Google decides a search is local, it feeds in data from its mapping service in a very prominent position. If you’re planning your search engine optimization strategy, you need to target Google’s map listings. Unless you’re the only Thai restaurant in your area, this is the only place you can realistically compete for organic (non-paid) listings on the most popular search index. To compete, you have to make sure that Google knows where your restaurant is, when it’s open and that it’s a restaurant (and not, say, a hairdresser). Google’s pretty good at figuring this out. But there are a few things you can do to make sure their information is correct, up-to-date and reliable. One way to accomplish this is to use my free Business Profile plugin for WordPress. If you’re running a WordPress site, it will allow you to enter your restaurant’s address, phone number and opening hours. It will then print this information to the page using Schema.org markup, which helps Google’s computers read and interpret this information correctly. That will help ensure that when Google throws up a map showing all the Thai restaurants in Chicago, they’ll include your website with a dot in the right location. This is absolutely vital in large markets. Maybe you’re lucky enough to have a great reputation that people travel across the city for. But if not then you need to capitalize on hyper-local searches — people from your neighborhood looking for something within walking distance. A similar approach would be to use the Local SEO plugin by Yoast. It costs $69 for one site, but it includes support for multiple venues as well as a venue locator feature. My Business Profile plugin only supports a single location, so it won’t work for everyone. Business Profile now supports multiple locations! If you’re willing to pay a more regular fee, you could also try Locu.com, a service provided by Trip Advisor. They allow you to declare your opening hours, restaurant menus, contact details and more, and immediately push this information out to third-party services, like Yelp, Facebook, OpenTable and more. It’s a nice little time-saver if you regularly change your information and don’t want to have to track this data across all of your sites. The plugins above will help you get on the map for your local searches — literally and figuratively. They all use what we call “on-site” SEO techniques. These are the things you have the most control over — the content and markup of your site. By ensuring this information is properly displayed on your site, you can be confident that Google will give you fair play in its local searches. But if you look at the screenshot from above again, you’ll notice that a few of the Thai restaurants in Chicago are promoted more heavily than others. That’s where you really want to be. So how do you get there? To win at this game, you need to invest in what we call “off-site” SEO techniques. These are the things that you don’t have direct control over. They include making sure you’re listed on third-party sites like Yelp and Facebook. But you’ll also want to build what we call “inbound links”. These are links you get from other sites. Maybe there’s a local restaurant review blog in your area. Or your local chamber of commerce will list your restaurant’s website. Especially valuable are links from high-profile sites, like your local newspaper. Seek out local websites in your area that might feature your business and ask them to review or link back to you. Lastly, but perhaps most important for Google, is that you want to have an active, well-reviewed page on Google+. Haven’t heard of Google+? It’s Google’s own social networking platform. They tried to make a Facebook, but to be honest it hasn’t gone well for them. It’s not very widely used, except for one very important user: Google. Let’s take another look at that screenshot above. And this time I want you to look closely at the top three listings Google is displaying for actual Thai restaurants in Chicago. Every one of the top three listings has a large number of reviews. Where do those reviews come from? You guessed it: Google+. This is why, even though few people use Google+ directly, it’s an extraordinarily valuable profile to have. Create your restaurant’s Google+ page today if you haven’t already, and then encourage your visitors to review you as much as possible. A word of warning. Don’t try to stuff your Google+ page with lots of fake reviews. And don’t try to generate a ton of fake sites that link back to your own. Google is pretty good at picking up on fraud, and they will ban your business completely if they decide that you’re trying to game the system. Do the extra work to get genuine reviews and links to your site. Otherwise you risk a severe penalty. Want some more tips on running your restaurant website with WordPress? Sign up for my mailing list or follow me on Twitter.